The lone American off the planet has cast his vote from space, keeping with NASA's motto of "Vote while you float." NASA said Monday that astronaut Shane Kimbrough filed his ballot in Tuesday's presidential election from the International Space Station sometime over the past few days. He arrived at the orbiting lab in mid-October. Before launching on a four-month mission, Kimbrough said it was going to be special, being able to say "I voted from space." By the time he's back on Earth in February, America will have a new commander in chief. Astronauts are "pretty much apolitical," he told reporters last month. "And I'll be glad to welcome the new president, whoever that is." The previous U.S. space station resident, Kate Rubins, also cast an absentee ballot from up there, before returning to Earth a week ago, according to NASA. A 1997 Texas law allows U.S. astronauts to vote from space. 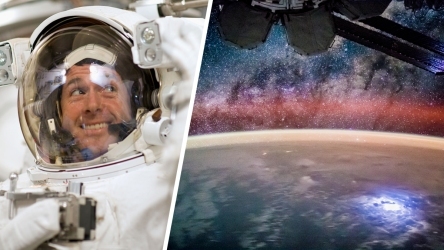 For NASA astronauts, home is Houston when they're not circling the globe. A secure electronic ballot is forwarded to the astronauts by Mission Control in Houston and returned by email to the county clerk. Kimbrough is sharing the space station with two Russians. The crew will double in size at the end of next week, adding another American, a Russian and a Frenchman.